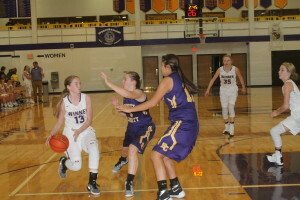 After taking a 19-6 lead in the first quarter, Winner Lady Warriors basketball team raced to a 58-19 victory over Bennett County on Jan. 17 in Winner. Madyson Frazier had a season high 26 points. Chloe Bartels and Rachel Sherman each added 7 points. Strong on the boards, Bella Swedlund pulled down 8 of Winner’s 36 rebounds. Sherman grabbed 7 rebounds. Morgan Hammerbeck had 6 steals.